In celebration of Earth Day, The Lexington School’s fourth grade took a field trip where they experienced what Earth Day feels like. It feels local, interconnected, helpful, and sustainable. They didn’t have to travel far to find all of those adjectives at the ready. 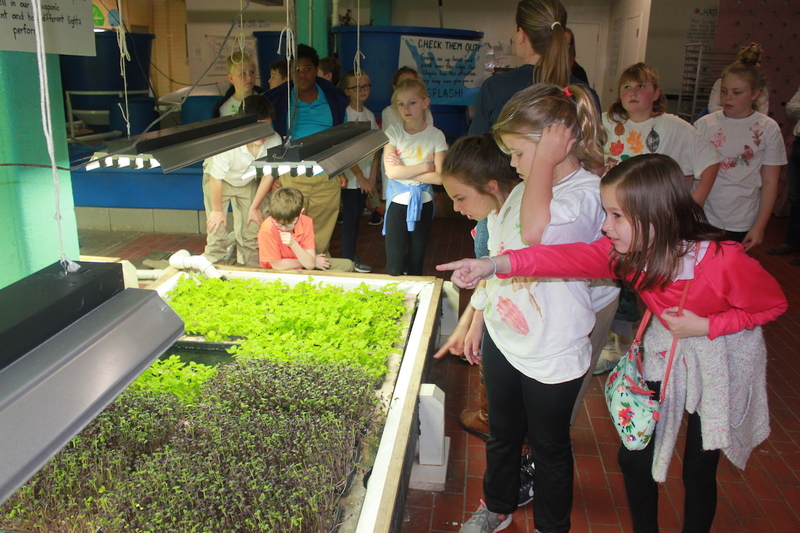 They carpooled to downtown Lexington where within a city block they learned how everyday can be earth day. Wondering why 4th graders are heading to a brewery for an Earth Day celebration? It’s not for the beer, of course. Brady Barlow, TLS parent and co-proprietor of West Sixth, gave the group a lesson on the environmental impact reusable resources can have. West Sixth makes and sells a lot of beer. Rather than throwing out their waste, they use it to feed fish. Brady poured a glass of brewing waste and explained how the waste goes right next door to FoodChain to feed the tilapia locally raised there. A quick walk down the sidewalk exposed 4th graders to FoodChain’s “innovative aquaponics farm from which [they] teach producers about methods of agriculture for economic diversity, teach kids and adults about where food comes from in an urban environment, develop the market for the freshest greens, micro-greens and seafood in the city, and outreach to [the] community about why it matters for the future of food” (FoodChain website). It is a cool place for kids to learn. You can see sustainable, local food growth right in front of your eyes. The tilapia eat the West Sixth brewery waste, and the water from the tilapia tank is used to raise the hydroponic greens. The tilapia and greens are sold and used by the restaurant in the same facility, Smithtown Seafood. It all works together. After a nature talk and field games with 4th grade Naturalist, Jawanna Herd, and an eco-friendly, packed, bag lunch, TLS 4th graders carpooled back to school where they canvassed the 40 acre campus for litter. This Earth Day trip was an action-packed day that came full-circle and fit perfectly into the theme of interconnectedness 4th grade science classes at TLS discuss throughout their year. Once again at TLS, experience teaches the lesson. In this case, getting outside four walls showed everyone involved that everyday really can be Earth Day.